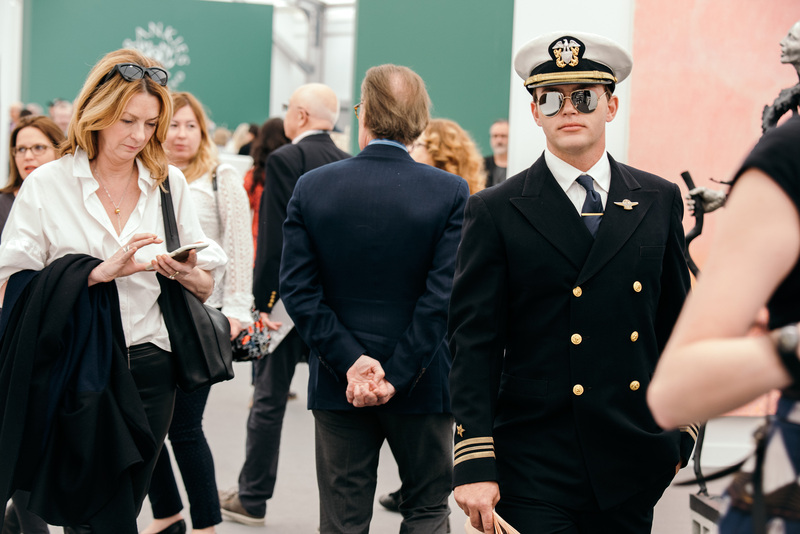 The crowd at Frieze New York hardly bats an eye when Leonardo DiCaprio makes his carefully low-key appearance at the annual fair on Randall’s Island. But today, starting at 11 a.m. sharp, when today’s preview event for the fair began with a push of art collectors and art advisers recalling Pamplona’s running of the bulls, Leo could be seen quite openly, calming strutting around the fair. In fact, there were three of him. And each was styled not in sunglasses and hat but rather as a character he has played over the years: Frank Abagnale, Jr. in a pilot’s suit from Catch Me If You Can (2002), Jordan Belfort in dark pinstripes from The Wolf of Wall Street (2013), and Hugh Glass in rank layers of fur from The Revenant (2016). The trio of doppelgangers are a new, and heretofore unannounced, site-specific performance planned and staged by the Brooklyn-based Croatian artist Dora Budor. The performance, commissioned by Cecilia Alemani, the curator for Frieze Projects, continues through Sunday during fair hours. 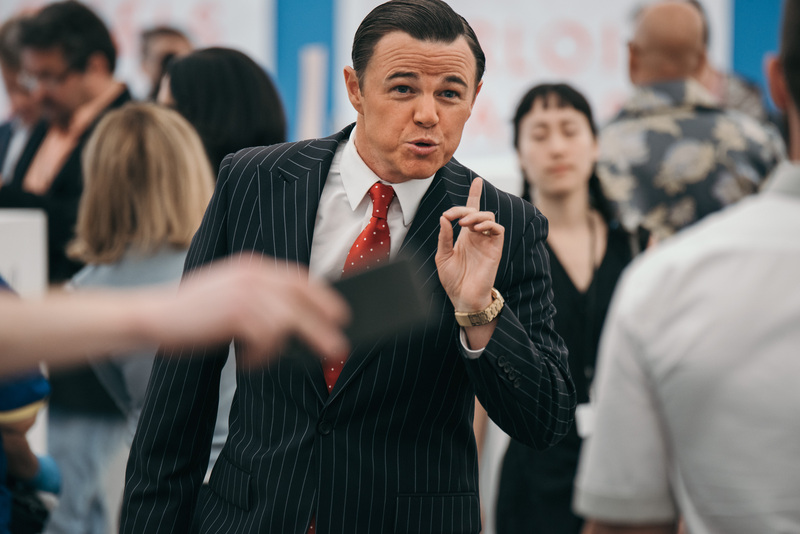 “I wanted to create the opportunity for unsuspecting visitors at the fair to experience a disjointed reality—believing that the actor Leonardo DiCaprio might be there, but seeing him, impossibly, many years younger and as characters he has played,” Budor said this morning as she oversaw the costuming. Miami collectors Mera and Don Rubell caught a glimpse of Belfort in his pinstriped suit as they finished an early lunch. There was some debate at their table: was it actually Leonardo DiCaprio? “It wouldn’t be shocking for him to actually be doing this because I know he loves the art and doesn’t take himself too seriously for being a big star,” Mera mused. 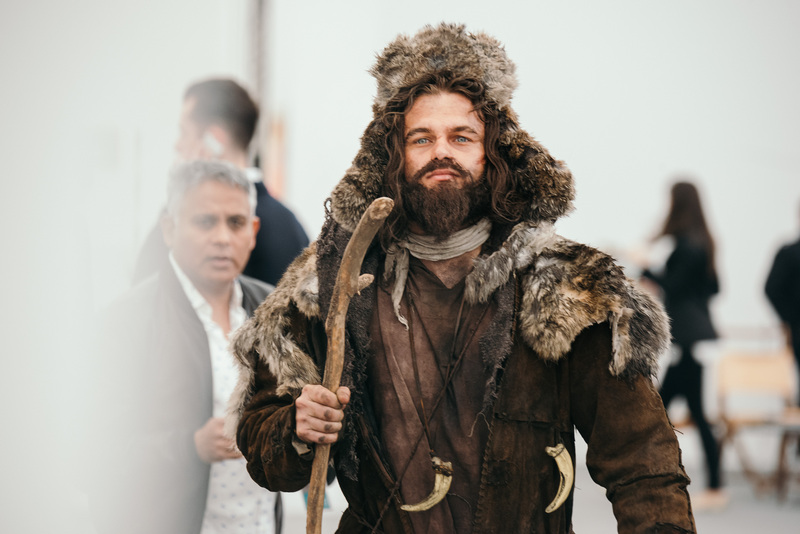 Meanwhile, passing the grizzled Hugh Glass character bedecked in furs outside Henrique Faria‘s booth, ARTnews Top 200 collector Beth Rudin DeWoody –a New Yorker–didn’t even blink. Budor said the genesis of her new project was when she thought she saw the Oscar-winning actor at the London version of Frieze two years ago. “I am still not sure but that triggered in my brain all his roles and the cinematic characters that he played,” she recalled. The artist emigrated nine years ago from the former Yugoslavia where her parents were artists; her grandfather was a well-known actor; and her grandmother a film and TV director. Budor’s early fascination with cinema has pervaded her practice, which is grounded in sculpture, architectural interventions, and performance. Her career took off in 2014 when she won the Rema Hort Emerging Artist Grant. Her works frequently investigate the subtexts of mainstream cinema and often make use of original props from the film, or sculptural re-imaginings of them, as in her installation in the Whitney’s “Dreamlands” show, for which she tracked down and bought the amphibious props from that famous scene in Paul Thomas Anderson’s movie Magnolia in which frogs fall from the sky. Beginning June 14, she will be in “The Dream of Forms,” a big group show at Palais de Tokyo in Paris that runs through September 10, and right now she has sculptures in shows on New York’s High Line and at Antenna Gallery in Shanghai. This morning at 8 a.m., in a sliver of space behind a booth at Frieze, a crew of five (make-up, wardrobe, props, hair, etc.) began working on Leo Kukhar, the actor who would be portraying the burly, bearded, filthy, scarred character from The Revenant. Standing on a dirty plywood floor amidst a snarl of electrical cords, a pink coiffed hairdresser trimmed and sprayed a long dark wig as a hatted hipster trimmed a fake beard. “Where’s that bear-claw necklace?” the costumer muttered to herself, “Ah, I found it!” She used its sharp point to etch the shape of a spiral into a metal canteen, replicating a key prop and plot point in the movie. The other men, whose stylings were far less elaborate, arrived in their street clothes a half hour before the preview opened, slipping unnoticed into the make-shift trailer as a trot of VIPs emerged from a breakfast in one of the VIP lounges. The actors dressed themselves, glancing over a buffet of makeup and hair products at images of each character duct-taped to the back of booth’s wall. Shortly before releasing each Leo, one by one, into the fair, Budor introduced her photographer, who would be documenting the performance for the artist’s use in a future project. “Guys, please remember his face because he will be shadowing you all day,” she directed the actors, adding that they should not acknowledge the photographer’s presence.